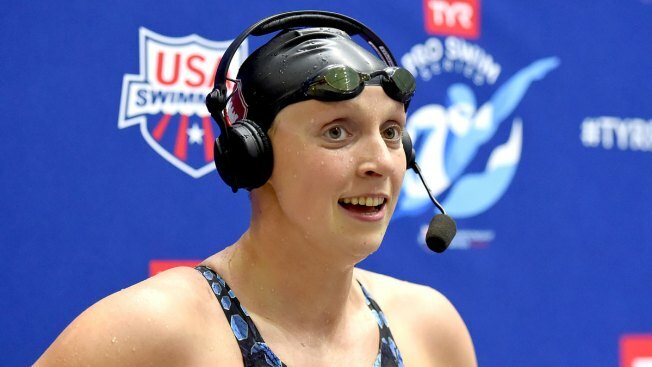 Katie Ledecky is interviewed after winning the women's 800 meter freestyle final during the fourth day of TYR Pro Swim Series at Indiana University Natatorium on May 19, 2018 in Indianapolis, Indiana. Katie Ledecky won the 200-meter freestyle at an outdoor meet in Northern California on Saturday with the world's fastest time this year. Ledecky is competing in her second meet since turning pro. Last month, she lowered her own world record by 5 seconds in the 1,500 free in Indianapolis. She attends nearby Stanford University.